During nine months of captivity, Kate Winters has survived a jealous goddess, a vengeful Titan and a pregnancy she never asked for. Now the Queen of the Gods wants her unborn child, and Kate can’t stop her–until Cronus offers a deal. The publisher kindly let me review this book. No compensation was given to alter this review. Thank you! 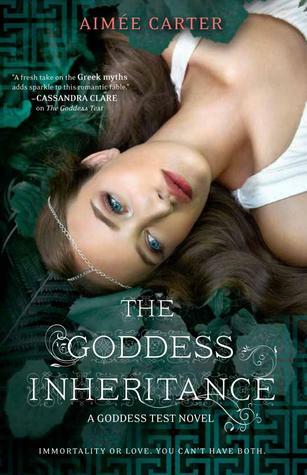 The Goddess Inheritance is the final instalment to Aimee Carter’s mythology trilogy. I am a Greek Mythology need so I set the expectations uber high. While I enjoyed the book, I wasn’t really emotionally attached or sad to see the series leave. In fact, I may have been a little relieved. An appeasing yet maddening conclusion that we have all been anticipating for. The story begins with Kate in Calliope’s wrath. Just about to give birth from after nine months of Ava’s betrayal. When a threat has been made, Kate must decide between her husband of her son, the destruction of the world or her family. The Goddess Inheritance is the god of despicable decisions and twists. If you recall, I wrote a lengthy paragraph of my annoyance towards Kate Winters, our protagonist in Goddess Interrupted. It is now true that some people never change. While Kate may seem like another potent female, she can be rather described as ‘the opposite’. From the beginning, she was naive, believing everything that she was informed on. I tried my hardest to reason with her as she was in a desperate time, but Kate is a cry baby. I could compare with her new born son who merely just gave a wail. Even James had stated that she was not the old Kate from the one in the first novel. There are two other main things that irritated me. Is it just me or were the whole ‘I’m sacrificing this for you’ repetitive. It was what the book revolved around, as well as book 2. I like sacrifices on a whole, makes the character more desirable and the entire story more on edge. Notwithstanding, Aimee Cater excessively uses this. Kate needed to sacrifice herself for her son…her mum….and Henry. Yadidadida. It’s like over using rhetorical questions in a argumentative essay. Lame and infuriating. The second frustration was the depth. On a scale of one to ten, the amount of depth combined into this was a 3. I had no emotions boiling up-well apart from annoyance. It is imperative for authors to have some high degree of depth in those novels to successfully capture one’s attention for the entire book. Now, for the minor problem. The romance. It screamed forced and a little artificial. Constantly, I wanted to grab them and just make them have their romantic, cute moment. That really didn’t come and satisfy me till the end. However, I still adored the family reunions. So squeal worthy. Overall, Aimee Carter did a spectacular job of tackling my favourite genre. Maybe more polishing up in the future, but a intriguing start. I hear her there is another series by her coming out so I am keenly awaiting. I can’t wait to read this! I loved Goddess Interrupted. I love your review!